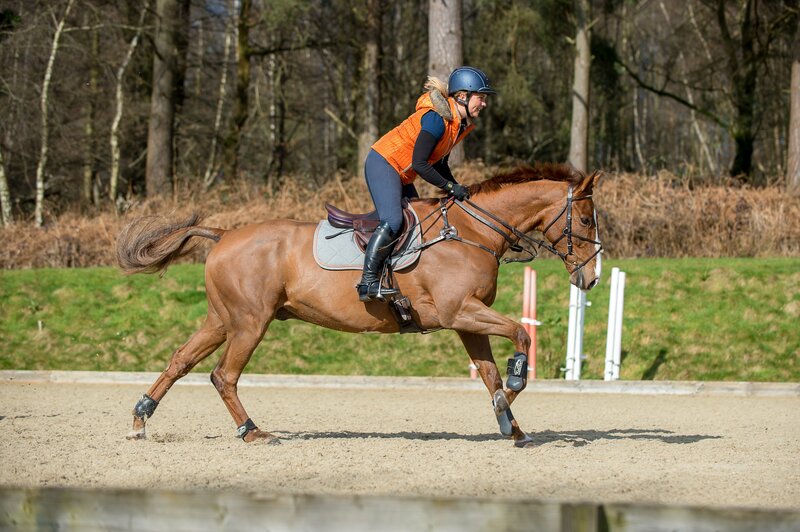 Being able to vary your pace within the canter has a wide range of benefits, as Olympic eventer Gemma Tattersall explains in this feature. Riding her talented horse, Chilli Knight, an eight year old Advanced horse, Gemma explains how to integrate some useful exercises, courtesy of her sponsor Childéric Saddles. "With these exercises, your goal is to help train your eye and to teach the horse to be more adjustable within the canter," explains Gemma. 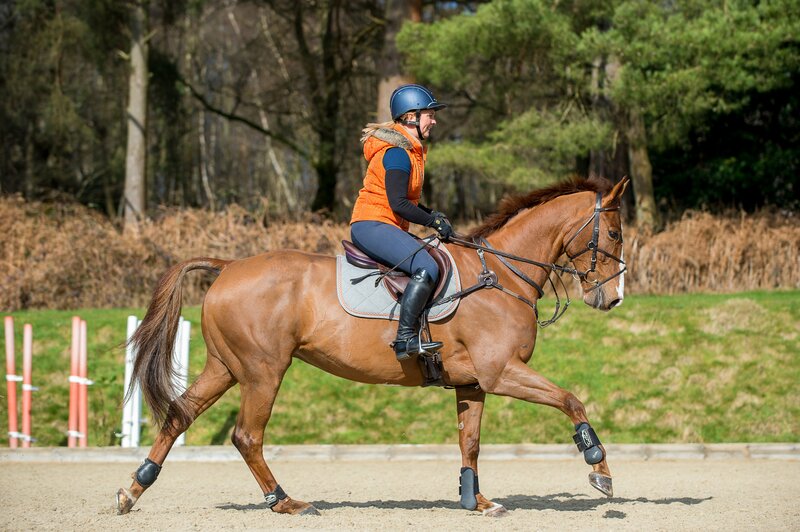 Gemma recommends always starting off with a good warm-up to ensure that the horse is listening to you and mentally and physically prepared to start learning. "You can either use poles on the ground or fences. Although poles may seem easier, this exercise actually works better with fences, as you have to ride more positively and make it happen," says Gemma. "I would recommend using two small upright fences on an eight stride distance. Technically this is not a related distance, but if you want to walk it, it should be 24ft for one stride (to include take-off and landing) with another 12ft for each additional stride. "Once you have warmed up on the flat, come to your fences a couple of times in each direction so that your horse knows this is a jumping session. You can increase the size of the fences as you go along, but I would keep them small if you just want to concentrate on the canter." Gemma then suggests using the whole of your school to change the rhythm of your canter and on the long side ride a forward canter later, on the short sides sit up and shorten the canter strides. "Really think about making the horse sit back and take the weight on his hind legs. Use the corners of the school to help you. When you come out of the short side, allow the canter to lengthen down the long side. It's not about going flat out, but about increasing the length of the stride." Once you have done this a few times and feel you have control both increasing and decreasing stride length then Gemma suggests coming back to your jumps. "Pop over the fences on a normal stride pattern (eight strides in this example). Do this in both directions so that it feels easy and comfortable," says Gemma. "Then decide if you are going to try shortening or lengthening first. If you are shortening, firstly try to take one additional stride between your fences, so in this example nine strides. 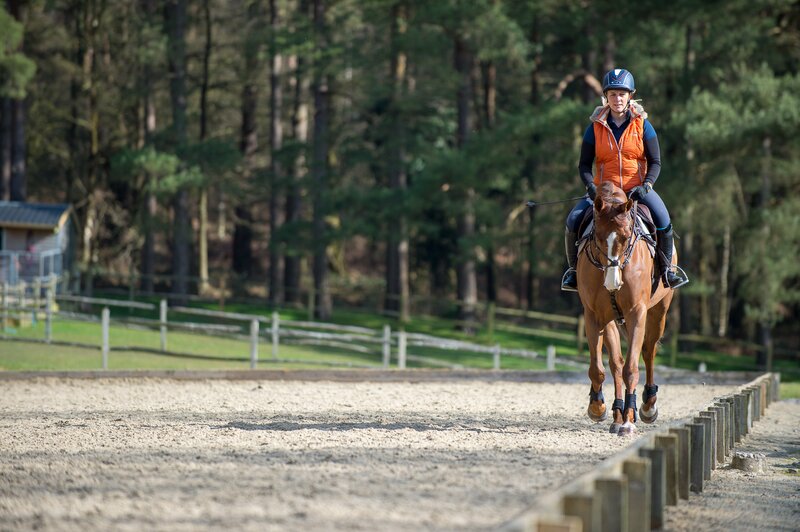 Make sure you get the canter you want before approaching your fences, so use the whole school to prepare. This way the canter should not change approaching or between the fences and it will not be a panic to get an additional stride in." Gemma suggests doing this a few times in both directions until it feels smooth and comfortable. 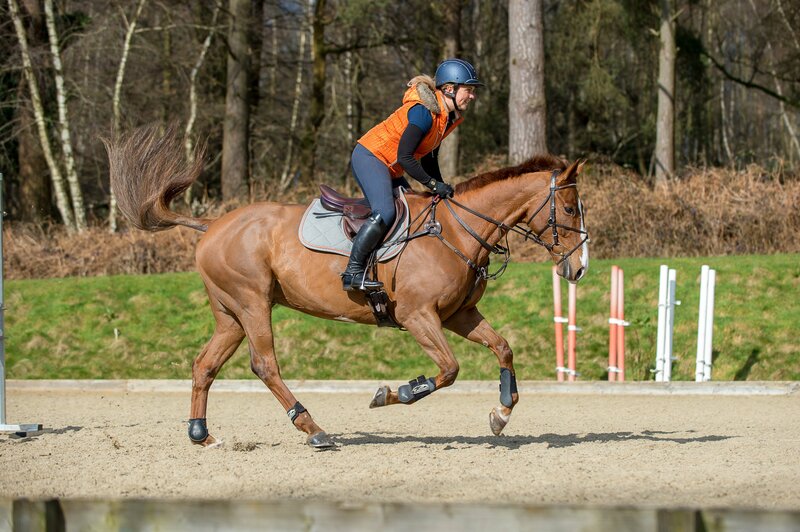 If it is hard to maintain the shorter canter all of the time, then take a break between attempts and/or come back to a normal canter for some of the time between attempts. 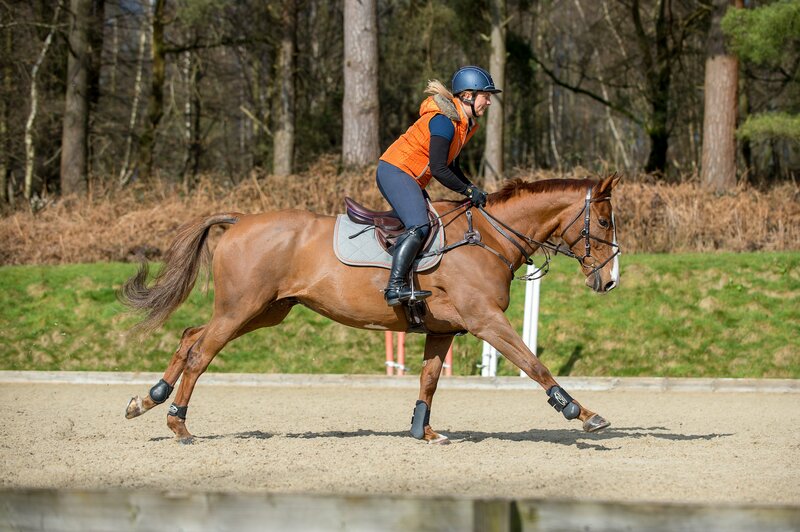 Gemma encourages you to remember to use your body to help: "Really sit up to come into a more collected canter and then relax slightly to allow your horse to become more forward underneath you and open up the canter stride." 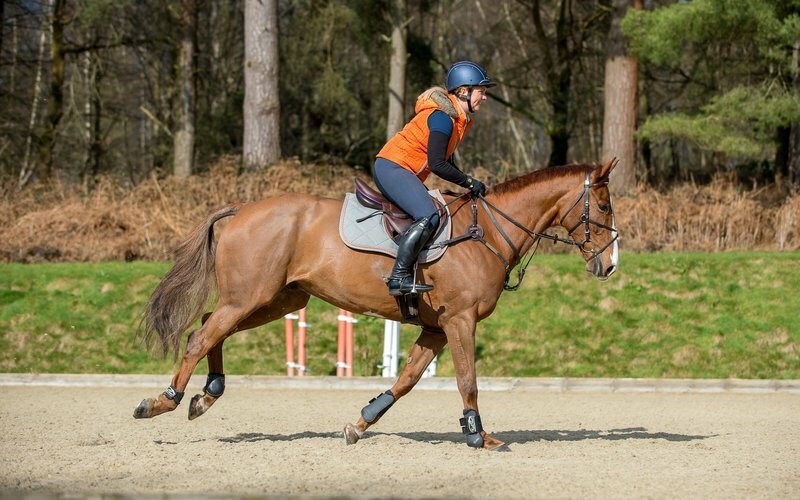 Gemma explains how you can develop this exercise if it's going well: "If you feel confident doing this and feel you could make an even shorter canter then try fitting in 10 strides. However, whatever you do, keep riding to your fences and try to keep in a rhythm." The below images show Gemma shortening the stride. When you have done this, then come to the fences in a normal canter again and then use the whole school to practice lengthening. "Once you have a nice lengthened canter then try to come to the fences and take out one stride, so take seven strides between the two fences." The below images show Gemma lengthening the stride. "If this is easy then you can try taking only six strides between the fences. Be careful that you don’t end up going flat out though!" warns Gemma. 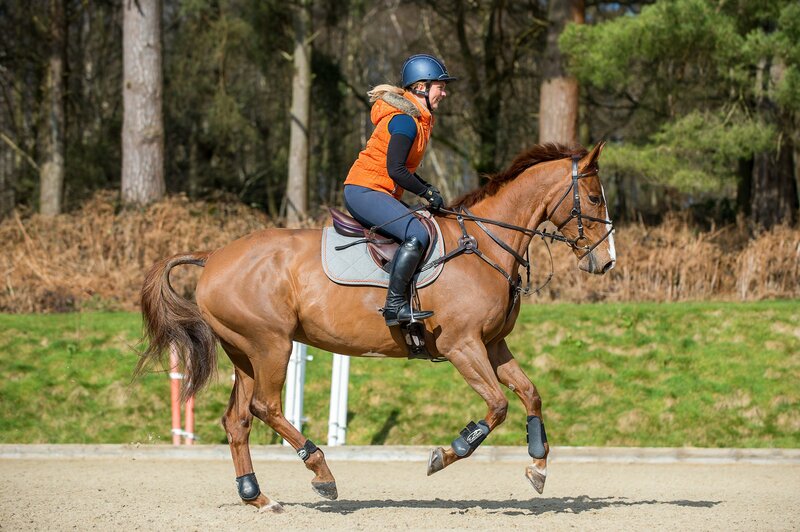 "Make sure you finish by going through the combination in a normal canter, so it again feels easy and comfortable for the horse," explains Gemma. 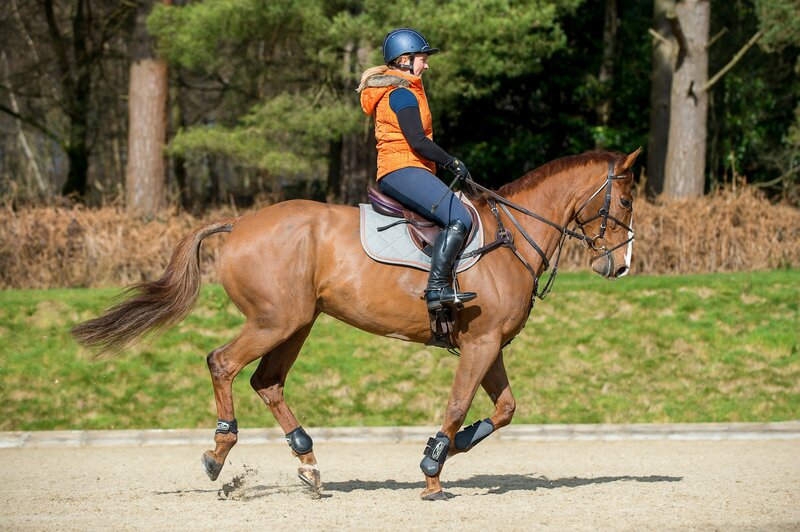 The variation of strides which you can manage will depend on you and your horse, not only his or her's experience, but also their temperament," explains Gemma. 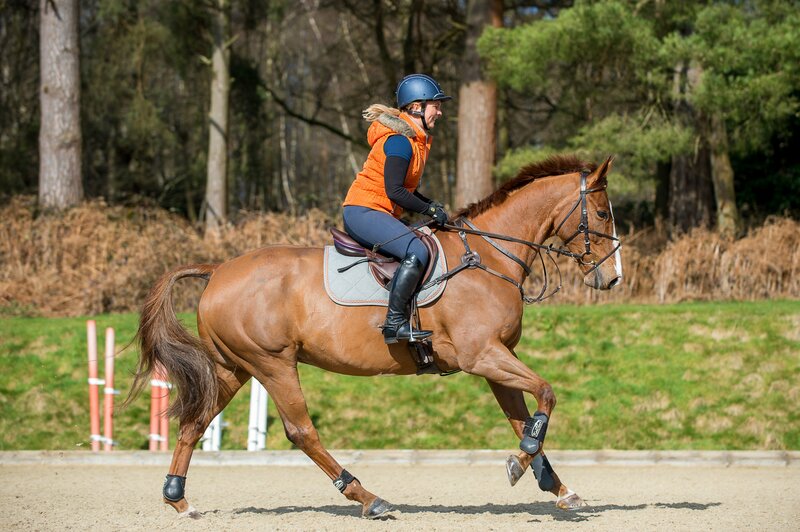 "If you have a very buzzy horse, it may not suit you to try the lengthened canter, so you can work between the normal and the collected strides. It is, however, a beneficial (and quite fun!) exercise to incorporate into your training." Gemma is a British Olympic event rider. Having started riding at the age of 18 months (as her mother had a riding school), she proved to be a natural, and by the time she was eight had won the riding club junior (U17) dressage championship and her first one day event. The World Class Programme has supported Gemma since she was 16 years old and represented Great Britain at Young Rider level twice, winning two gold medals. A familiar face at Mitsubishi Motors Badminton and Land Rover Burghley, Gemma represented Great Britain again in the 2016 Olympics, and in 2017 Gemma became the first woman to win the prestigious Event Rider Masters. In 2018 Gemma was an instrumental part of the gold medal-winning GB eventing team at the World Equestrian Games.